Managing your customer calls effectively is crucial to the success of your business. Attending all incoming calls is an opportunity to maintain and grow your company. A Responsive Call Answering Service can help you create the best customer call flow system so that you can do what you do best: running your business. This is why thousands of entrepreneurs and business operations managers now turn to a highly responsive call answering service to manage their call centers. By hiring a top-quality call answering service, they free up their time to strategize and take important client calls rather than spending it bombarded by customer requests that are easily and efficiently handled by the service. An important part of a call center is Call Flow Management, so all good call answering services work from flow charts that they design with you and your staff. The chart basically details the paths of all types of calls from the time they are received to when they are concluded. Some of these charts can be quite complicated yet function as a scripted response for call center service staff to use to handle virtually any call scenario that your business experiences. 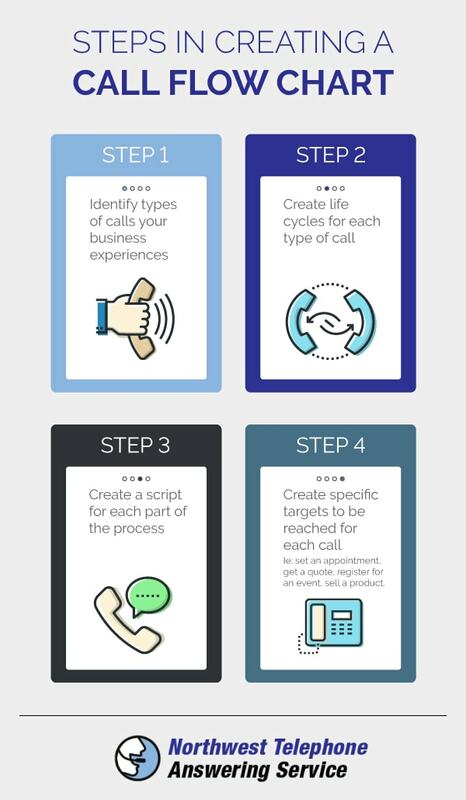 Because the call flow chart details the life cycles of each type of call your business receives, the call answering service separates every type and maps out a pathway for the call to various staff either within your business or within its call center. Such calls likely include sales, customer service, and quality control. Each will likely include the basic steps of greeting, the discovery of the issue the customer (or potential customer) wants to discuss, the solution offered, any further service or product to be offered, and closing statement. The scripts also will include the transfer procedure each department would follow should callers need to speak with staff across more than one department. The goal is to make sure that none of your customer calls slip through any cracks in the process. To measure the success of your call answering service staff, targets are agreed upon and set with the staff so they know what is expected. At Northwest Telephone Answering Service we have been working with businesses like yours since 1970, providing live operators 7 days a week, 24 hours a day to handle your business call needs so you do not have to rely on answering machines or automated systems. Our state-of-the-art equipment allows us to make sure you never miss out on your customers’ calls. When a caller speaks to one of our live representatives, we want to make them feel as though it is one of your very own staff members answering their call hence the need for to have the proper call flow established. Our phone representatives will study the call flow and follow any directives you may set forth. Contact us today to talk about what we can do for you and your business.